As competitors converge on the Gold Coast this week for the Australian Surf Life Saving Championships, SoldOut are celebrating 26-years as Surf Life Saving Australia’s (SLSA) Event Agency. SoldOut’s CEO Thomas B. Staunton said their enduring partnership with SLSA has been strengthened further by the signing of a new multiyear contract which will see them continue to deliver ‘The Aussies’ and support SLSA’s events. In celebration of their ongoing relationship, SoldOut are extending their support beyond the national body. “While we continue our support the movement at a national level, we also want to extend our involvement at a local level, so we’re giving all lifesaving clubs in Australia a special offer on signage and marquees,” said Staunton. 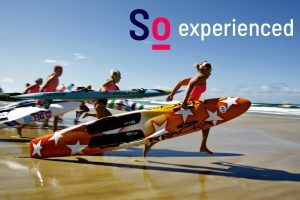 With a proven record in delivering the Australian Championships, Fiona Crockett General Manager Communication & Partnerships at SLSA said renewing their partnership with SoldOut was an easy decision. “SoldOut have seamlessly delivered our major events for the past 26 years, and I’m pleased they will be continuing as our official event agency in the future. “With SoldOut on board, we are confident our event will continued to be delivered to world-class standards,” said Fiona. The Australian Championships will be hosted at Broadbeach SLSC and North Burleigh SLSC on the Gold Coast from 30 March to 7 April 2019. For more details on the SoldOut’s special offer for lifesaving clubs, visit our special offers page.